To the extent that this recursive process has a beginning, action begins with our most direct source of goals: desires and duties. Goals seem to energize simply by existing: we are lured by rewards, excited by opportunities, and roused by fears. The word motivation alludes to this connection: it can mean the reason and/or the will to act. The amount of bundled energy is proportionate to the desirability of the goal and the clarity of the path to it. We don’t need an elaborate model to explain what energizes us to walk across the kitchen for a cookie, or stand in line for a freebie, or sprint away from danger. Complex actions may be comparably self-sufficient if we can partition them into clear chunks: if each subgoal provides enough energy for its own achievement then we may need nothing else to progress towards distant goals. Energy brought by goals is supplemented with energy supplied by their achievement. Success is intrinsically rewarding which invigorates us to complete the task and begin another. How much energy we harvest from goals and accomplishments depends on how well we optimize action to provide clarity, avoid resistance, and generate wins. Such ability to create effective action hierarchies depends on the quality of our models and capabilities – on competence. Competence energizes us indirectly by saving focus and energy that would be spent on dreams and dread, by partitioning the task into manageable chunks that bring a series of successes, by giving clarity and confidence, and by reducing resistance. Concurrently, competence increases the probability of achieving flow, which is not only a psychological energy equivalent of riding the thermals, but also a deeply satisfying experience that encourages action. However, clarity and competence can only get us so far. Even if we successfully hack plans into a maximally motivating arrangement of small, clear goals; eliminate avoidable mistakes; and relish in the use of our skills, overcoming resistance will often demand more. Eventually, we reach the limits of our models and capabilities and face unavoidable uncertainty, adversity, and toil. Eventually, significant goals require additional sources of energy. Perseverance is our deepest energy reserve. It is a habit of not giving up that lowers action energy requirements. It is a skill in overcoming obstacles that energizes like other forms of competence. Finally, it is a meta-capability that is integrated with our identity: its energy reserves are proportionate to its significance to our self-valuation. The desire to succeed isn’t the only thing: other values and aspirations restrict the methods we consider appropriate and goals we consider worthwhile. We want to be a good person who strives for true, desirable, possible ends. A system of thought that defines such long-term goals, justifies them, and coheres them with identity is our vision. Visions give us the faith to persevere through resistance and doubt. They interact with desires and duties to direct and motivate us. They are powerful, overarching, and ostensibly certain and clear. The simplicity and cohesiveness we feel tends to turn subtle and amorphous with attempts at precise articulation, yet we continue to easily recognize those actions that fit into our vision and those that contradict it. This intuitive recognition of fit between action, identity, and vision is inspiration. It is our final source of energy. The most powerful aspect of inspiration is its ability to refuel perseverance by justifying the necessity and value of effort and connecting it with identity. The perseverance machinery then works with competence to provide the required perspiration or exhaust itself trying. Successful effort rewards us with the attainment of our goal – a satisfied desire, a discharged duty, a step towards our vision – as well as with the pleasure of triumph itself. But effects extend beyond the immediate rewards and pleasures. 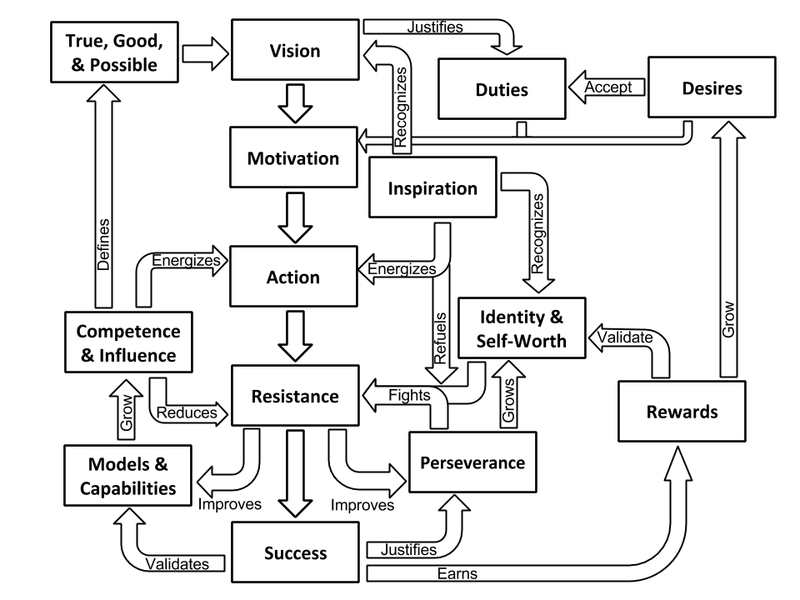 Success validates the models used to create action hierarchies and skills used to execute them which grows confidence. It vindicates perseverance which strengthens resolve. While success validates, resistance questions models and capabilities, tests determination, challenges identity – and thus compels improvement. Facing resistance develops perseverance, justifies desert, and grows the value of effort to identity. It advances models and capabilities which expands the sphere of influence, clarifies vision, and enhances future actions. Accomplishment, confidence, influence, and resolve swell our identity which grows our capacity to be inspired and fight through resistance. Failure can turn this virtuous cycle against us. Our confidence shrinks and our identity becomes less tied to accomplishment. The extent to which this happens depends on how we interpret and respond to failure – which itself depends on the clarity of our vision and the strength of our identity. The attitude towards effort is therefore path dependent and increasingly stable. Our system remains incomplete. It omits explicit connections of competence and influence with self-worth; of models, capabilities, desires, and duties with identity; of truth and goodness with models; and so on. It is focused on a specific action, pursued to achieve a specific goal that is rooted in a specific vision, but we pursue a variety of goals from different visions. To relieve these deficiencies, we can assign a separate instance of the framework to each vision and construe every action as an iteration within such an instance. Visions depend on, as well as develop, distinct sets of models, skills, values, and expectations, though some of the components end up identical between instances. This component sharing exposes each instance to unpredictable external influences: skill improvements in one instance may affect execution in others; models created in one pursuit may challenge justifications in another. The most interesting instance is that of our identity. Identity’s vision most often completes the missing connections: competence or influence or truth or goodness are frequently its direct goals. 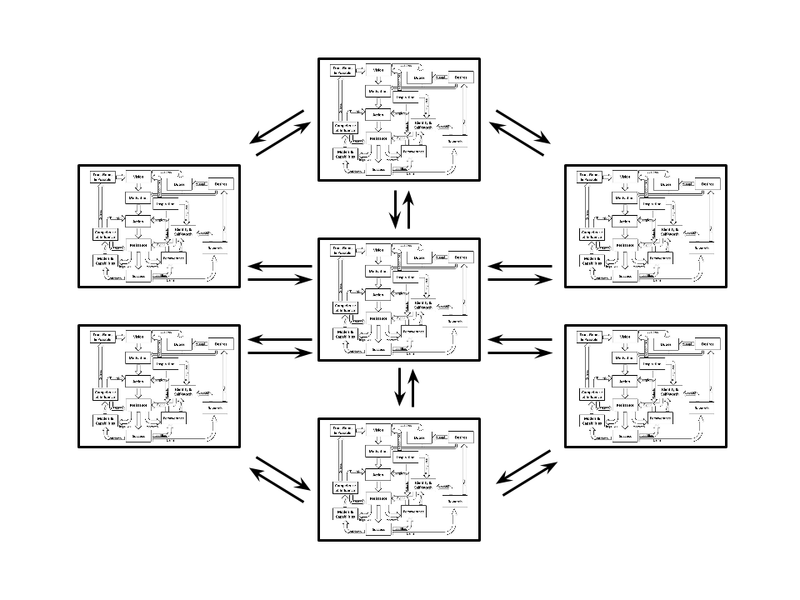 Moreover, it is uniquely essential to all the others – connected to them like the center instance in the diagram above. Early action commences with a barebones instance. Humans begin with no duties and infinitesimal capabilities, but an infinitely grand identity: that of being God-like. This implies unquestionably true, good, and possible desires; a vision of their willful fulfillment; and boundless contempt for resistance. The infant’s ostensibly infinite energy is rooted in flawless clarity. Their action is perfectly inspired – without uncertainty or disconnect between motivation, vision, or identity. This allows desire and identity to provide all the purpose and energy a budding human needs – to bootstrap action. Action drives evolution from solipsism to social being by advancing models and capabilities. 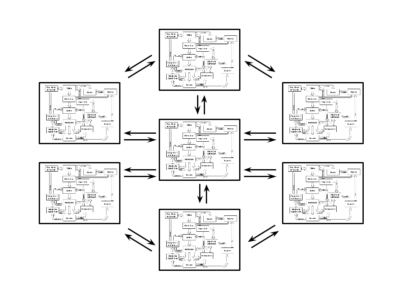 Explicit justifications replace implicit ones, visions sprout, duties are accepted, and a mature, interconnected set of instances emerges. So identity’s vision is not only separate from the others and essential to all of them. It is the fountainhead of other pursuits. In other words, action is bootstrapped by basic desires like comfort, knowledge, and volition energized by a primal form of pride unconcerned with comparison – what Rousseau called amour de soi. Pride – the sense of importance, capability, worth – is the linchpin of identity’s vision. In initial solipsism, pride is content without explicit goals of its own. It pursues worth implicitly by doing the bidding of other desires, thus energizing early action. It is validated by overcome obstacles, acquired capabilities, and increased understanding. As identity matures, its vision becomes intertwined with external visions and our self-valuation becomes more dependent on performance within these visions. We remain proud of our achievements, competence, and goodness, but are no longer satisfied with self-evaluation: we must be measured and recognized externally. Pride acquires explicit goals of its own: to push identity to improve and assure it a fair valuation. It may seem objectionable to elevate pride to such importance. Indeed, pride is a complex and imperfect term that is difficult to define precisely enough to rank unequivocally. Nevertheless, its primacy over alternatives is tenable. There is a wealth of insight in these philosophical efforts, but two lessons suffice: there is no obvious, framework-independent term; and the privileged status of pride, by whatever name, is defensible. External visions guide the direction of our efforts and the metrics with which we measure competence and goodness. We come to value goals, judgements, and obligations of communal visions. We sacrifice time, effort, and desires to further them. We want to be recognized for our commitment to their values; for our ability to advance their goals; for our contributions, efforts, and sacrifices. We become enmeshed with external visions, but are never completely subsumed by them. Our identity remains distinct with its own proud goals of worth, integrity, justice, and recognition. We prioritize communal goals over individual ones when we are convinced that they are more ethical, correct, or important – which makes performance within them a better measure of our worth. Grander visions substantiate greater merit which engenders more motivation and legitimizes bigger sacrifices. But only if we believe such visions to be sufficiently true, complete, coherent, and effective. The perceived truth of justifications is the backbone on which our buy-in rests. Visions of community and identity are connected by shared models that justify them both. When the community embraces goals, values, and explanations it also commits to a compatible valuation of individuals and their actions – which guides identity’s vision. This valuation manifests as a commensurate distribution of rewards and recognition. When external reality matches our understanding and external recognition matches our estimation, the visions of community and identity feel true and in sync – and we can sometimes act with clarity and inspiration of an infant. But when conflicts arise, we feel confused, cheated, and tempted to assert our independent interests – which drains purpose and energy. Communal buy-in predisposes us to trust the community and to temper our desires for the “greater good”. But rewards validate both identity and truth. Perceived unfairness doesn’t just sting pride; it challenges the foundations of goodness and truth that legitimize communal visions, justify individual duties, and inspire. As such experiences mount, we become increasingly reluctant to sacrifice for communal visions. This lowers their effectiveness which compounds doubt. Deterioration of communal vision intensifies the attack on identity. Moreover, it challenges the justifications for past sacrifices which urges pride to seek retribution: being made a sucker is perhaps the only affront greater than inadequate recognition. Anything that points out flaws in communal visions can challenge the basis for individual motivation and sense of worth and initiate this destructive cycle, though it often begins with an insult to pride. Conversely, anything that grows confidence in external visions can enhance individual energy and dignity and improve the vision’s effectiveness. The visions of identity and the external world are intimately connected.